The teaching of Religious Education in Australian Catholic Schools has faced many challenges. Since Catholicism first planted its roots in the Australian countryside in the nineteenth century, R.E. has grown, changed, adapted and been threatened. And now it thrives. This book explains how, in a modern world where Catholicism reworks and reconstructs its methodology in the interests of pastoral care, evangelism, and Christian Education, religious education is moving forward successfully to meet the needs of Australian families. 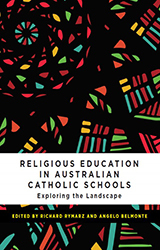 Over twenty leading Australian educators share their experiences and expertise on addressing the challenges of teaching Religious Education in today’s Catholic Schools. In its leaves you will find critical perspectives on the development of Australian Catholic School R.E. In the first nine chapters you will read about curriculum, leadership in R.E., varying contexts and the historical developments. In the following nine chapters you will be able to explore different curriculums across the country and compare the different approaches to Catholic religious education. For those involved in religious education, this book will provide an enhanced understanding of key issues and how these shape teaching and curriculum planning.